This article is about the general framework of distance and direction. For the space beyond Earth’s atmosphere, see Outer space. For the keyboard key, see Space bar. For all other uses, see Space (disambiguation). A right-handed three-dimensionalCartesian coordinate system used to indicate positions in space. Space is the boundless three-dimensional extent in which objects and events have relative position and direction. 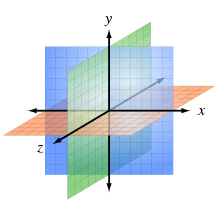 Physical space is often conceived in three linear dimensions, although modern physicists usually consider it, with time, to be part of a boundless four-dimensional continuum known as spacetime. In mathematics, “spaces” are examined with different numbers of dimensions and with different underlying structures. The concept of space is considered to be of fundamental importance to an understanding of the physical universe. However, disagreement continues between philosophers over whether it is itself an entity, a relationship between entities, or part of a conceptual framework. Debates concerning the nature, essence and the mode of existence of space date back to antiquity; namely, to treatises like theTimaeus of Plato, or Socrates in his reflections on what the Greeks called khora (i.e. “space”), or in the Physics of Aristotle (Book IV, Delta) in the definition of topos (i.e. place), or even in the later “geometrical conception of place” as “space qua extension” in theDiscourse on Place (Qawl fi al-Makan) of the 11th-century Arab polymath Alhazen. Many of these classical philosophical questions were discussed in the Renaissance and then reformulated in the 17th century, particularly during the early development of classical mechanics. In Isaac Newton’s view, space was absolute—in the sense that it existed permanently and independently of whether there were any matter in the space. Other natural philosophers, notably Gottfried Leibniz, thought instead that space was in fact a collection of relations between objects, given by their distance and direction from one another. In the 18th century, the philosopher and theologian George Berkeley attempted to refute the “visibility of spatial depth” in his Essay Towards a New Theory of Vision. Later, themetaphysician Immanuel Kant said neither space nor time can be empirically perceived, they are elements of a systematic framework that humans use to structure all experiences. Kant referred to “space” in his Critique of Pure Reason as being: a subjective “pure a priori form of intuition”, hence it is an unavoidable contribution of our human faculties. In the 19th and 20th centuries mathematicians began to examine non-Euclidean geometries, in which space can be said to be curved, rather than flat. According to Albert Einstein’s theory of general relativity, space around gravitational fields deviates from Euclidean space. Experimental tests of general relativity have confirmed that non-Euclidean space provides a better model for the shape of space. In the seventeenth century, the philosophy of space and time emerged as a central issue in epistemology and metaphysics. At its heart,Gottfried Leibniz, the German philosopher-mathematician, and Isaac Newton, the English physicist-mathematician, set out two opposing theories of what space is. Rather than being an entity that independently exists over and above other matter, Leibniz held that space is no more than the collection of spatial relations between objects in the world: “space is that which results from places taken together”. Unoccupied regions are those that could have objects in them, and thus spatial relations with other places. For Leibniz, then, space was an idealised abstraction from the relations between individual entities or their possible locations and therefore could not be continuous but must be discrete. Space could be thought of in a similar way to the relations between family members. 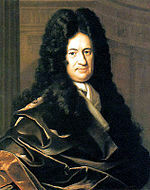 Although people in the family are related to one another, the relations do not exist independently of the people Leibniz argued that space could not exist independently of objects in the world because that implies a difference between two universes exactly alike except for the location of the material world in each universe. But since there would be no observational way of telling these universes apart then, according to the identity of indiscernibles, there would be no real difference between them. According to the principle of sufficient reason, any theory of space that implied that there could be these two possible universes, must therefore be wrong. Newton took space to be more than relations between material objects and based his position on observation and experimentation. For arelationist there can be no real difference between inertial motion, in which the object travels with constant velocity, and non-inertial motion, in which the velocity changes with time, since all spatial measurements are relative to other objects and their motions. 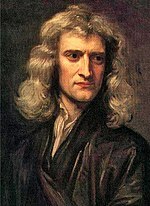 But Newton argued that since non-inertial motion generates forces, it must be absolute. He used the example of water in a spinning bucket to demonstrate his argument. Water in a bucket is hung from a rope and set to spin, starts with a flat surface. After a while, as the bucket continues to spin, the surface of the water becomes concave. If the bucket’s spinning is stopped then the surface of the water remains concave as it continues to spin. The concave surface is therefore apparently not the result of relative motion between the bucket and the water. Instead, Newton argued, it must be a result of non-inertial motion relative to space itself. For several centuries the bucket argument was decisive in showing that space must exist independently of matter. 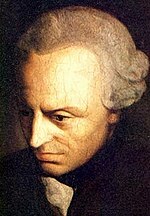 In the eighteenth century the German philosopher Immanuel Kant developed a theory of knowledge in which knowledge about space can be botha priori and synthetic. According to Kant, knowledge about space is synthetic, in that statements about space are not simply true by virtue of the meaning of the words in the statement. In his work, Kant rejected the view that space must be either a substance or relation. Instead he came to the conclusion that space and time are not discovered by humans to be objective features of the world, but are part of an unavoidable systematic framework for organizing our experiences. 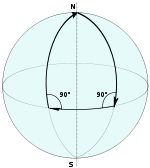 Spherical geometry is similar to elliptical geometry. On the surfaceof a sphere there are noparallel lines. Euclid’s Elements contained five postulates that form the basis for Euclidean geometry. One of these, the parallel postulate has been the subject of debate among mathematicians for many centuries. It states that on any plane on which there is a straight line L1 and a point P not on L1, there is only one straight line L2 on the plane that passes through the point P and is parallel to the straight line L1. Until the 19th century, few doubted the truth of the postulate; instead debate centered over whether it was necessary as an axiom, or whether it was a theory that could be derived from the other axioms. Around 1830 though, the Hungarian János Bolyai and the Russian Nikolai Ivanovich Lobachevsky separately published treatises on a type of geometry that does not include the parallel postulate, called hyperbolic geometry. In this geometry, an infinite number of parallel lines pass through the point P. Consequently the sum of angles in a triangle is less than 180° and the ratio of a circle’s circumference to its diameteris greater than pi. In the 1850s, Bernhard Riemann developed an equivalent theory of elliptical geometry, in which no parallel lines pass throughP. In this geometry, triangles have more than 180° and circles have a ratio of circumference-to-diameter that is less than pi. Although there was a prevailing Kantian consensus at the time, once non-Euclidean geometries had been formalised, some began to wonder whether or not physical space is curved. 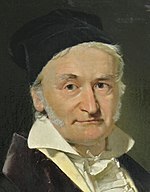 Carl Friedrich Gauss, a German mathematician, was the first to consider an empirical investigation of the geometrical structure of space. He thought of making a test of the sum of the angles of an enormous stellar triangle and there are reports he actually carried out a test, on a small scale, by triangulating mountain tops in Germany. 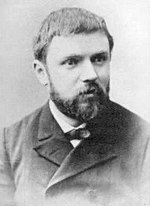 Henri Poincaré, a French mathematician and physicist of the late 19th century introduced an important insight in which he attempted to demonstrate the futility of any attempt to discover which geometry applies to space by experiment. He considered the predicament that would face scientists if they were confined to the surface of an imaginary large sphere with particular properties, known as a sphere-world. In this world, the temperature is taken to vary in such a way that all objects expand and contract in similar proportions in different places on the sphere. With a suitable falloff in temperature, if the scientists try to use measuring rods to determine the sum of the angles in a triangle, they can be deceived into thinking that they inhabit a plane, rather than a spherical surface. In fact, the scientists cannot in principle determine whether they inhabit a plane or sphere and, Poincaré argued, the same is true for the debate over whether real space is Euclidean or not. For him, which geometry was used to describe space, was a matter of convention. Since Euclidean geometry is simpler than non-Euclidean geometry, he assumed the former would always be used to describe the ‘true’ geometry of the world. In 1905, Albert Einstein published a paper on a special theory of relativity, in which he proposed that space and time be combined into a single construct known as spacetime. In this theory, the speed of light in a vacuum is the same for all observers—which has the result that two events that appear simultaneous to one particular observer will not be simultaneous to another observer if the observers are moving with respect to one another. Moreover, an observer will measure a moving clock to tick more slowly than one that is stationary with respect to them; and objects are measured to be shortened in the direction that they are moving with respect to the observer. 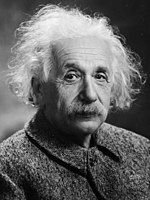 Over the following ten years Einstein worked on a general theory of relativity, which is a theory of how gravity interacts with spacetime. Instead of viewing gravity as a force field acting in spacetime, Einstein suggested that it modifies the geometric structure of spacetime itself. According to the general theory, time goes more slowly at places with lower gravitational potentials and rays of light bend in the presence of a gravitational field. Scientists have studied the behaviour of binary pulsars, confirming the predictions of Einstein’s theories and non-Euclidean geometry is usually used to describe spacetime. In modern mathematics spaces are defined as sets with some added structure. They are frequently described as different types of manifolds, which are spaces that locally approximate to Euclidean space, and where the properties are defined largely on local connectedness of points that lie on the manifold. There are however, many diverse mathematical objects that are called spaces. For example, vector spaces such as function spaces may have infinite numbers of independent dimensions and a notion of distance very different from Euclidean space, and topological spaces replace the concept of distance with a more abstract idea of nearness. Space is one of the few fundamental quantities in physics, meaning that it cannot be defined via other quantities because nothing more fundamental is known at the present. On the other hand, it can be related to other fundamental quantities. Thus, similar to other fundamental quantities (like time and mass), space can be explored via measurement and experiment. Before Einstein’s work on relativistic physics, time and space were viewed as independent dimensions. Einstein’s discoveries showed that due to relativity of motion our space and time can be mathematically combined into one object — spacetime. It turns out that distances in space or in time separately are not invariant with respect to Lorentz coordinate transformations, but distances in Minkowski space-time along space-time intervals are—which justifies the name. In addition, time and space dimensions should not be viewed as exactly equivalent in Minkowski space-time. One can freely move in space but not in time. Thus, time and space coordinates are treated differently both in special relativity (where time is sometimes considered an imaginary coordinate) and in general relativity (where different signs are assigned to time and space components ofspacetime metric). Furthermore, in Einstein’s general theory of relativity, it is postulated that space-time is geometrically distorted- curved -near to gravitationally significant masses. One consequence of this postulate, which follows from the equations of general relativity, is the prediction of moving ripples of space-time, called gravitational waves. While indirect evidence for these waves has been found (in the motions of the Hulse–Taylor binary system, for example) experiments attempting to directly measure these waves are ongoing. Relativity theory leads to the cosmological question of what shape the universe is, and where space came from. It appears that space was created in the Big Bang, 13.8 billion years ago and has been expanding ever since. The overall shape of space is not known, but space is known to be expanding very rapidly due to the Cosmic Inflation. The measurement of physical space has long been important. Although earlier societies had developed measuring systems, the International System of Units, (SI), is now the most common system of units used in the measuring of space, and is almost universally used. Currently, the standard space interval, called a standard meter or simply meter, is defined as the distance traveled by light in a vacuum during a time interval of exactly 1/299,792,458 of a second. This definition coupled with present definition of the second is based on the special theory of relativity in which the speed of light plays the role of a fundamental constant of nature. Geography is the branch of science concerned with identifying and describing the Earth, utilizing spatial awareness to try to understand why things exist in specific locations. Cartography is the mapping of spaces to allow better navigation, for visualization purposes and to act as a locational device. Geostatistics apply statistical concepts to collected spatial data to create an estimate for unobserved phenomena. Geographical space is often considered as land, and can have a relation to ownership usage (in which space is seen as property or territory). While some cultures assert the rights of the individual in terms of ownership, other cultures will identify with a communal approach to land ownership, while still other cultures such as Australian Aboriginals, rather than asserting ownership rights to land, invert the relationship and consider that they are in fact owned by the land. Spatial planning is a method of regulating the use of space at land-level, with decisions made at regional, national and international levels. Space can also impact on human and cultural behavior, being an important factor inarchitecture, where it will impact on the design of buildings and structures, and on farming. Ownership of space is not restricted to land. Ownership of airspace and of waters is decided internationally. Other forms of ownership have been recently asserted to other spaces—for example to the radio bands of the electromagnetic spectrum or to cyberspace. Public space is a term used to define areas of land as collectively owned by the community, and managed in their name by delegated bodies; such spaces are open to all, while private property is the land culturally owned by an individual or company, for their own use and pleasure. Abstract space is a term used in geography to refer to a hypothetical space characterized by complete homogeneity. When modeling activity or behavior, it is a conceptual tool used to limit extraneous variables such as terrain. Psychologists first began to study the way space is perceived in the middle of the 19th century. Those now concerned with such studies regard it as a distinct branch ofpsychology. Psychologists analyzing the perception of space are concerned with how recognition of an object’s physical appearance or its interactions are perceived, see, for example, visual space. Other, more specialized topics studied include amodal perception and object permanence. The perception of surroundings is important due to its necessary relevance to survival, especially with regards to hunting and self preservation as well as simply one’s idea of personal space. Several space-related phobias have been identified, including agoraphobia (the fear of open spaces), astrophobia (the fear of celestial space) and claustrophobia (the fear of enclosed spaces). Previous PostHexacosichoron (600-cell structure) – Trinh DoNext PostCan the opposite of a black hole exist?